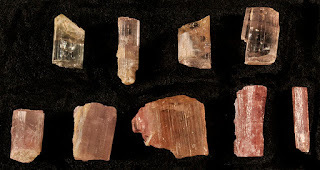 Rubellite, a gemstone variety of the mineral tourmaline, can be transparent and possesses a beautiful reddish pink to violet or light green color. It can also be nearly colorless. One of the best known localities for this gemstone is in the Pala mining district, at Pala, near San Diego in southern California. About 10 years ago, I was a member of a group of geologists invited to tour the historic Stewart Mine at Pala. We were allowed to search through discarded diggings, but I was able to find some nice specimens that were not too weathered. It is important to mention that this mine is on private land and getting permission to enter the land is absolutely needed. The individual crystals of rubellite on the left side of the picture are approximately 1 cm in height. The ones that appear somewhat blackish are transparent enough to show the black color of the background material on which they were photographed. The cluster of weathered crystals on the right is 5 cm in width. 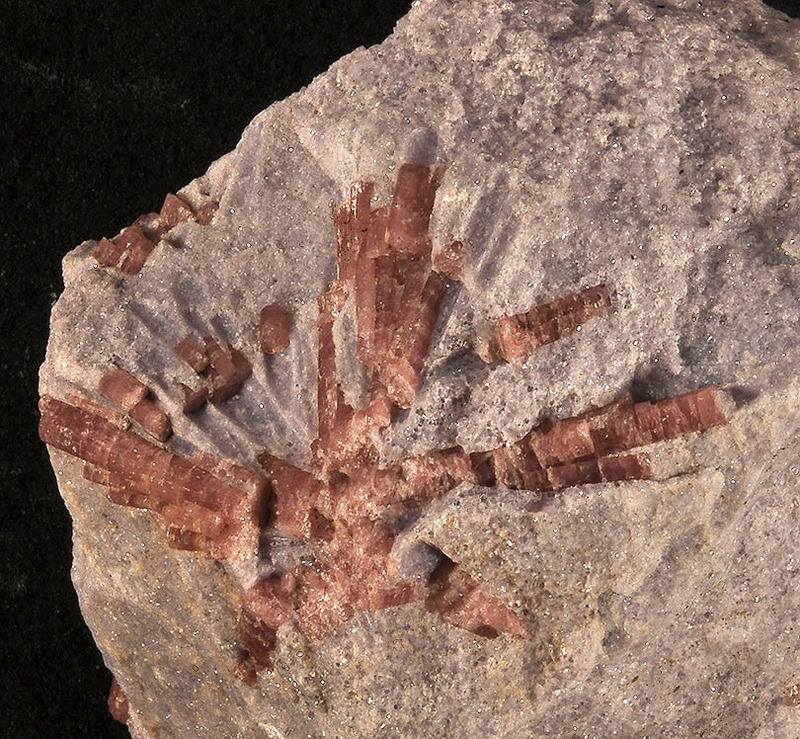 Rubellite from the Stewart Mine is commonly in a matrix consisting of the lithium-bearing mineral lepidolite (it is purple and shines a lot like mica). The cluster of rubellite shown above is in lepidolite. The rubellite in the Stewart Mine is found in a complex and highly mineralized granitic pegmatite-aplite dike.